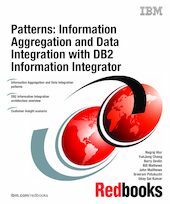 This IBM Redbooks publication documents and prototypes the role of DB2 Information Integrator technologies and architecture in IBM's Patterns for e-business using a typical customer insight e-business scenario. It is aimed at an audience of IT architects and data integration professionals responsible for developing e-business solutions that integrate processes and data from multiple distributed heterogeneous systems. This publication provides an overview of IBM’s Patterns for e-business, and the DB2 Information Integration architecture. It also describes the various application and runtime patterns identified to date for Information Aggregation and Data Integration, as defined in "Patterns for e-business". Using a typical customer insight e-business scenario, this publication documents the step-by-step patterns approach to implementing the e-business solution. At each level in the hierarchy, each available pattern is evaluated and chosen before drilling down to the next lower layer where the pattern evaluation and selection process is repeated. The final drill down leads to product selection and implementation information.